The University of Virginia men’s basketball team came out victorious in this year’s tournament after a disappionting first-round exit last year (Photograph courtesy of Aaron Lavinsky/Minneapolis Star Tribune/TNS). For the 2019 National Collegiate Athletic Association Division I men’s basketball championships, the No. 3 Texas Tech University Raiders and the No. 1 University of Virginia Cavaliers took the stage together for the first time in history April 8. This was the 12th NCAA game for head coach Chris Beard of Texas Tech and the 24th game for head coach Tony Bennett of Virginia. Coach Bennett received the 2018 Coach of the Year award while this year, coach Beard received the award. After last season, Texas Tech lost four of their starters — three of these players graduated from the team, including Zhaire Smith, who now plays for the Philadelphia 76ers. 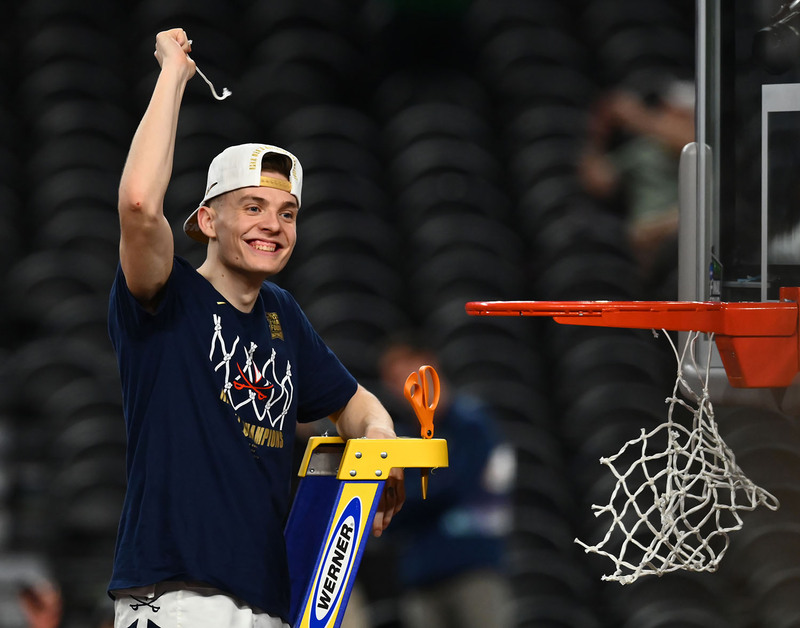 This was the first national championship in the past 40 years in which two first-time participants played in the championship game. In addition, Virginia had never played Texas Tech, but both teams came in with some star players and strong defense that made it seem like this would be one of the lowest scoring championship games in history. For reference, the lowest scoring game was the 2011 NCAA championship game between Butler University and the University of Connecticut. UConn won 53-41 with Kemba Walker on the team who now plays for the Charlotte Hornets. Virginia was ranked first in the nation for scoring defense, and Texas Tech lead the nation in field-goal percentage defense. As a team, Virginia has averaged fewer than nine turnovers per game this season. Texas Tech hoped to become the second national championship winner for the state of Texas since Texas Western College, now the University of Texas at El Paso, achieved the first in 1966. Coming into this game, Virginia was 28-0 when they had the lead at halftime and 32-0 when they held their opponents to under 50 percent for field goals. To support his alma mater Texas Tech, Patrick Mahomes, now the quarterback for the Kansas City Chiefs, was in attendance to this game. Kicking off the first half, Texas Tech grabbed the tip off to start play. Sophomore Jarrett Culver took the first shot from deep, but it bounced off the hoop as the ball went to Virginia. Culver was Texas Tech’s first player to be named the Big 12 player of the year for this season, as he led the team in scoring, rebounds and assists. The ball was passed to sophomore Davide Moretti who missed his jump shot. After two possessions, Texas Tech couldn’t get past the Virginia defense. With almost two minutes gone in the first half, Virginia redshirt junior Mamadi Diakite hit his jumper assisted by junior Ty Jerome for the first points of the game. During each possession, it was clear that this game would go to the final buzzer as teams were running out the shot-clock for each play. After the first five minutes of the half had passed and only one field goal had been made, Virginia junior Kyle Guy stole the ball from Texas Tech redshirt senior Matt Mooney. Guy drove to the other end of the court to make a clean shot for two to get the Virginia momentum going. In Virginia’s previous game against No. 5 Auburn University, Guy was sent to the free throw line with less than one second to go in the game after a crucial call was made on his three-point attempt. He was sent to the line to shoot three as Virginia was down 62-60 against Auburn. He ended up making all three free throws, helping Virginia take the final win 63-62. Many reporters spoke of how the referees missed a double-dribble call earlier in the game against Virginia, but at the end of the day, the correct call was made for the foul on Auburn that sent Guy to the line. With 13:41 to play in the first half, Jerome hit a three for Virginia, increasing their lead to 7-3. Then, after a Texas Tech turnover, junior Braxton Key slammed down a dunk, which kept the momentum for Virginia and also held Texas Tech to no buckets. This was also Texas Tech’s largest tournament deficit. With seven minutes left in the first half and neither team with double-digit points yet, it was time for one team to make a statement. Texas Tech made their first field goal on a three-pointer from Moretti as he closed the gap to 9-6 in favor of Virginia. Virginia had possession again and got the ball to Guy, who hit a step-back jumper from long that was originally called a two-point shot, as the referee believed his foot had been touching the line. They reviewed the shot and overturned the call to a three-point shot. After another foul on Virginia, Owens was sent to the line again for Texas Tech and went 1-2. Coach Beard then decided to substitute in two guys from the bench — redshirt senior Brandone Francis and freshman Kyler Edwards. On the next two Texas Tech possessions, both Francis and Edwards hit threes, sparking the momentum to the Texas side. With 7:33 to play before halftime, Moretti also hit a clean three to tie the game at 19. The teams pushed to stay tied over the next five minutes. With just under 2:30 to go, a foul was called on Virginia redshirt senior Jack Salt, which sent Moretti to the line. Moretti was the second in the nation in free-throw shooting at over 92 percent and the best free-throw shooter in the Big 12 conference. With 1:29 to play, Virginia tied it at 29, and then Jerome hit a three at the last second to head into halftime leading 32-29. Virginia was looking to be the first team to not play a No. 1 or No. 2 seed in the tournament since 1985. They held their offensive turnover rate to 13.7 percent on the season, which was the third lowest in the NCAA. Virginia had won 61-straight when leading at halftime. Only three of the last seven NCAA champions had lead at the half, and with Virginia’s record for this scenario, their win percentage increased. At the end of the first half, Texas Tech shot 8-24 from the field, 5-12 from three and 8-10 on free throws. Francis and Moretti each had eight points, and Texas Tech looked to improve on their numbers to be able to match up with the Virginia team. Virginia shot 12-29 from the field, 5-11 from deep and 3-4 on free throws. Guy lead the scoring with 10 points, while Jerome had eight points, five rebounds and four assists to start the night. Heading into the second half, Virginia won the jump ball and Guy hit a three to kick things off. Hunter, an NBA hopeful, had a slow start in the first half to get on the board for scoring, but he really opened up in the second half. He was named the Atlantic Coast Conference Defensive Player of the Year, and his efforts showed as Virginia was able to hold Texas Tech to no baskets in the first two minutes of the second half. With 13:25 to go, Hunter made a three-pointer from the top of the arc for 45-38, and Francis responded for Texas Tech with a three assisted by Culver. Hunter made another three with 11:45 to play, and it seemed like he had finally found his rhythm. Guy increased Virginia’s lead to 10 with a tough three from the far corner from a pocket pass from Jerome. Then, a turnover by Hunter gave Texas Tech the opportunity to bring the score to 53-47, still in Virginia’s favor as the clock ran under nine minutes to play. With 5:47 to go, a foul was called on Owens, and Hunter still made the layup increasing Virginia’s lead to 59-51. This was Owens’ fifth foul, which forced him to exit the floor. As this was his last game, it was bittersweet. The next eight points all went to Texas Tech for an 8-0 run to tie the game at 59 with 3:28 on the clock. Crucial fouls were called in the last three minutes of play, sending both teams to the line for free throws. A foul on Francis at 2:54 sent Diakite to the line. He made both free throws for 61-59 for Virginia. Then, a foul on Guy at 2:38, sent Culver to the line for two free throws to tie at 61. Under the two minute mark, Guy made a layup to go up 65-61, but Moretti hit a big three to bring Texas Tech within one point. After a rebound by Hunter, the ball went out of bounds for a turnover to Texas Tech with one second left to play. The play was reviewed, and the call stood as Texas Tech ball. Texas Tech inbounded to Culver, but Key went up for a clean block that sent it into overtime. The excitement rose in the stands as the cameras panned to fans already standing up waiting to see how this game would end. At the start of overtime, the teams traded points, but Mooney made a big jumper to put Texas Tech up 73-70. The overtime period was then filled with fouls, as both teams knew a five-minute period was too short to take any chances. A foul on Moretti sent Guy to shoot two, bringing Virginia to only a one-point deficit. Hunter hit another corner three to then put Virginia up 75-73. On the next three Texas Tech possessions, Culver missed a layup, Mooney missed a three and after Moretti got the defensive rebound, Hunter forced a Texas Tech turnover as he stole the ball. A foul was then called on Mooney, which sent Jerome to take two free-throws, and he made both. Then a foul on Moretti sent Guy back to the line, and as he had proven previously, he was a dependable free-throw shooter in crunch time. With 31 seconds to go, he made both free-throws to increase Virginia’s lead to six. With 16 seconds left, Texas Tech had gone 2-8 from the field in the overtime period, missing opportunities to score baskets on their crucial possessions. At the end, a foul on Mooney with eight seconds remaining sent Key to the line for two, which added to Virginia’s lead 85-77. In the last couple seconds, Mooney attempted a three for Texas Tech but missed, and the score stood to the final buzzer. Virginia went 12-12 for free throws in overtime. This was the first national championship in school history for Virginia and a heartbreaking loss for Texas Tech, who gave it their all to the last second. Overall, Virginia was more efficient across the board on shooting. They shot 27-59 from the field (45.8 percent), 11-24 from beyond the arc (45.8 percent) and made 20-23 free-throws (87 percent). Texas Tech shot 27-63 in field goals (42.9 percent), 10-30 for three-pointers (33.3 percent) and 13-15 for free-throws (86.7 percent). Hunter led Virginia in scoring with 27 points, and he also had nine rebounds. Guy had 24 points, and Jerome had 16 points. The leading scorer for Texas Tech was Francis off the bench who scored 17 points. Culver and Moretti both had 15 points. Texas Tech scored 29 points from their bench, while Virginia scored six points. In the final speeches from players and coaches, it was clear that both teams were ready to come back hungry next season. After a rough ending to their tournament hopes last season, Virginia was happy to be standing on the podium with the trophy this year. Texas Tech also made a statement this year, as they have a relatively young squad who now has championship experience to bring back to their training.